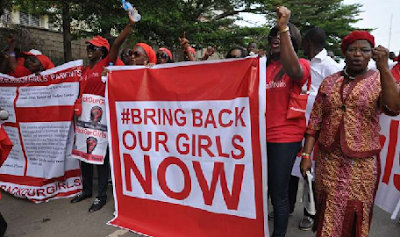 The members of the BringBackOurGirls (BBOG) advocacy group has promised to resume their maches come Tursday this week. The group’s spokesperson, Sesugh Akume, made this known in a statement..
“As announced three weeks ago on September 14, the #BringBackOurGirls movement shall be resuming marches to the State House every three working days to underscore the issues we have been raising and seeking to be addressed to no avail. “Our demands have been: The Federal Government must redouble efforts to immediately rescue or secure the release of our remaining 113 #ChibokGirls. “The Federal Government should immediately send a high-powered delegation to Chibok to reassure disconsolate parents of our missing 113 girls that are still in captivity. “The Federal Government and the Nigeria military should immediately provide the public with factual and accurate details on the kidnapped persons, including police personnel on the Borno-Adamawa road and the Nigeria National Petroleum Corporation (NNPC) exploration team. “The Federal Government should immediately invite the affected families of the victims of the Borno-Adamawa road kidnap, and the soldiers-NNPC-University of Maiduguri lecturers and staff for a full briefing on the tragedies that befell their relatives. “The Federal Government to set up the structured systems of public reporting on each specific abduction case, the general management of our IDPs as well as the entire prosecution of the counter-insurgency war.